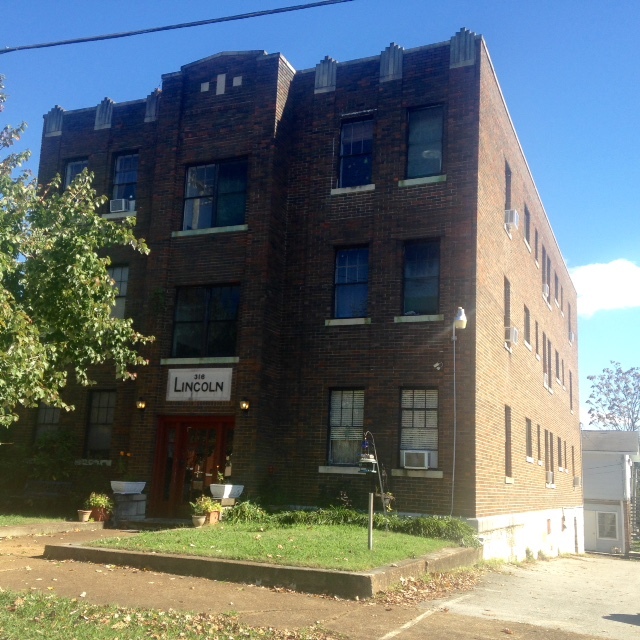 Downtown Chattanooga wasn't a sought-after address in the late 1970s, when George Burton Pierce bought the Lincoln Apartments. "Everybody's interested in living downtown again," said Pierce's daughter, Leslie Morris. The booming demand for downtown dwelling is one reason that Morris and other family members of the late Pierce, who died in January 2013 at age 90, decided to sell. The family hopes to get just under $1.2 million for the 12-unit, three-story apartment building at 316 High St., a "carriage house" behind it with a two-bedroom apartment upstairs, and a 30-space parking lot at 318 High St. Built in 1920, the Lincoln has hung on to its original character and features — despite the passage of almost a century. Just inside the terrazzo-tiled lobby, there's a panel of old, metal mailboxes that held an intercom system that once let visitors call residents. The one-bedroom and studio apartments have original oak floors, tiled bathrooms and wooden entrance doors that were stained, but never painted. The brick building was built for the ages, with a stone foundation and concrete subfloors supported by metal framing. That limits the noise residents hear from upstairs and downstairs apartments, compared to "stick-built" apartments with all-wood framing. "It's pretty quiet between floors," said Ken Bivin, a family member who helps manage the building. The Lincoln is so solidly built that it was designated as a bomb shelter, said real estate broker Chad Wamack of NAI Charter Real Estate Corp. in Chattanooga, which has listed the building for sale. "It literally has shelter signs on the back of it, that's how solid it is," Wamack said. Pierce, who for years ran his land surveying business from a first-floor apartment in the Lincoln, didn't feel the need to make many changes, his daughter said. "He was an engineer," Morris said, "and I think he really admired the integrity of the building." Interest from potential buyers has been high since the Lincoln was listed for sale about two weeks ago, Wamack said. Land prices are soaring all around the building, Wamack said, which is just down the street from the Hunter Museum of American Art and Rembrandt's Coffee House in the Bluff View Art District. A buyer could repurpose the building or knock it down, but Wamack expects it will continue to be used as apartments. Pierce also owned the Robert E. Lee apartments next door. "The Robert E. Lee and the Lincoln I always thought was a classic combo," Morris said. "[The Lincoln] really is a cool place. We will miss it." Contact staff writer Tim Omarzu at tomarzu@timesfreepress.com or www.facebook.com/MeetsFor Business or twitter.com/meetfor business or 423-757-6651.